Every July 4, Shepherd Center sponsors the Wheelchair Division of the AJC Peachtree Road Race in Atlanta. More than 60 world-class athletes from around the globe compete in this annual 10K event. 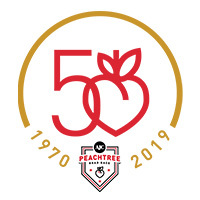 The AJC Peachtree Road Race will award up to $200,000 in bonus prize money to foot racers and wheelchair athletes who break an event record at the race’s 50th Running on July 4, 2019, the Atlanta Track Club has announced. Any male or female winner of the foot race or Shepherd Center's Wheelchair Division who tops the best times in the Elite Open Men and Elite Open Women divisions will be awarded – on top of prize money – a $50,000 bonus in honor of the 50th running. Shepherd Center is also participating in the America Series race events, which include the Cedartown 5K and the Meet in the Heat (see registration info below). The Wheelchair Division of the AJC Peachtree Road Race has been designated as the official Adaptive Track and Field USA (ATFUSA) national 10K event. The Wheelchair Division follows the course set for the Peachtree Road Race foot racers – 6.2 miles down Peachtree Road, starting at Lenox Road and ending on 10th Street at Piedmont Park in Midtown Atlanta. Learn more about the race and the new changes for 2019 at news.shepherd.org. Shepherd Center staff members, patients and their families always line the race route along Peachtree Road in front of the hospital to cheer on the wheelchair and foot racers. The event is covered live by WXIA-TV 11 Alive News in Atlanta. Race results are reported via Shepherd Center's social media channels (Facebook, Twitter and Instagram) and at news.shepherd.org. Results from previous year's races are available at the links below.